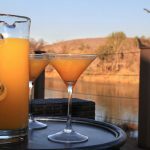 Home > QUICK GUIDES > CAMPING > AM I CAMPING WITH STYLE OR REALLY GLAMPING? 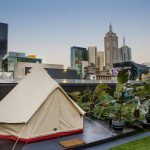 Glamping is the latest craze to sweep the global camping community, with plenty of folk leaving the cities and heading for the countryside to spend a week or two in padded luxury and grandeur. 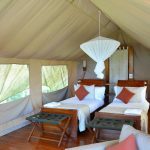 But if you really want to make sure you are glamping and not slumming it with the back-country bogans you need make sure your destination will meet certain glamping requirements. Any glampsite worth its salt has a selection of airy and cool lodging options. From a flowing teepee to a dignified yurt, a simple tent will just not do. The construction has to be large enough to stand up and walk around. Under no circumstance should you be forced to get dressed on your back and if you have to step over sleeping bodies to reach the entrance, you haven’t gone large enough. 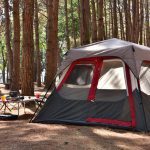 No glamper should have to mess about with inflating mattresses or unfolding chairs. A glampsite should have a cast iron bed if possible, complete with wooden wardrobe. There should also be a couple of lounge chairs to entertain guests at. If there is any plastic furniture in sight, you are essentially wallowing with the rest of them. Cavemen play with fire outside, glampers use log burning stoves. Similarly, forget collecting your water in a bucket to do the washing up. Glampsites use running water, with a small sink, a quaint drawer full of matching kitchen utensils and counter space sufficient to massage the Kobe beef. A shower block? Isn’t that what they have in prison? A glamper needs their own en-suite, complete with a flushing toilet and either shower or bath. There should be decorative wall hangings or pictures and preferably some nice smelling bath salts. Let the rest of the general population walk around smelling like they fell out of the middle ages, glampers hold themselves with decorum and elegance, and need to smell accordingly. Campers may paddle around in a rusty old canoe and wear their dents and battle scars with pride. Glampers measure their vessels in horsepower. You won’t catch glampers doing any paddling or rowing, you wouldn’t want to get all sweaty, right? Sitting out under the stars just feels a little prehistoric, right? To really get things going every glamper needs an iTunes synced LED lantern to light up the evening and bring the party to the glampsite. Gone are the days of a bearded hippie entertaining campers with an acoustic guitar and a sing-a-long. The glampers are 21st century breeds and need outdoor sound systems and Bluetooth speakers accordingly. If you don’t blast the music loud enough you might be disturbed by those chirping bird noises and dingo barks. Keep nature at bay with a personal boom-box and Avicii’s new tune. If your glampsite can’t meet these basic expectations, it is little more than a glorified pig sty. You are not a barbarian, you are a glamper. There are optional extras like chandeliers and espresso machines which make for nice glampsite touches. 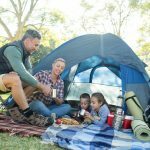 UNPLUGGED: DO WE NEED WIFI WHILE CAMPING?